President Donald Trump is reportedly working with Japan and South Korea to push for denuclearization of North Korea by 2020. But experts say the definition of denuclearization has a different meaning to the United States and North Korea so arriving at an agreement won't be easy or fast. Japan has proposed setting the target date for the summer of 2020, ahead of the Tokyo Olympics and Paralympics. 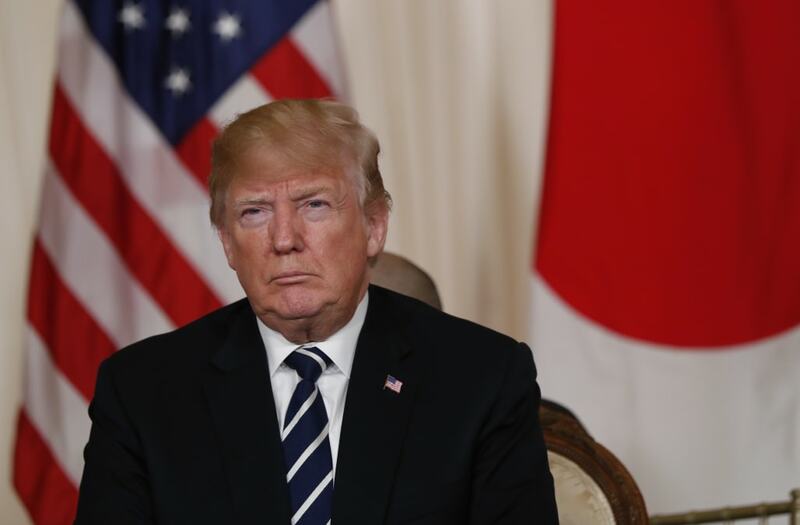 President Donald Trump is reportedly working with Japan and South Korea to push for the complete denuclearization of North Korea by 2020. Diplomatic officials told Kyodo News the president and his regional allies are seeking to end North Korea's developments of nuclear weapons, despite Kim Jong Un's previous commitment to using a "phased, synchronized" approach. Kim Jong Un touted his willingness for denuclearization on the Korean Peninsula in his meeting with Chinese President Xi Jinping last month, North Korean and Chinese state media reported. "If South Korea and the United States respond with goodwill to our efforts and create an atmosphere of peace and stability, and take phased, synchronized measures to achieve peace, the issue of the denuclearization of the peninsula can reach resolution," Chinese news agency Xinhua quoted Kim as saying. North Korean leader Kim Jong Un shakes hands with Chinese President Xi Jinping, as he paid an unofficial visit to China, in this undated photo released by North Korea's Korean Central News Agency (KCNA) in Pyongyang March 28,2018. KCNA/via Reuters ATTENTION EDITORS - THIS IMAGE WAS PROVIDED BY A THIRD PARTY. REUTERS IS UNABLE TO INDEPENDENTLY VERIFY THIS IMAGE. NO THIRD PARTY SALES. NOT FOR USE BY REUTERS THIRD PARTY DISTRIBUTORS. SOUTH KOREA OUT. NO COMMERCIAL OR EDITORIAL SALES IN SOUTH KOREA. North Korean leader Kim Jong Un shakes hands with Chinese President Xi Jinping as he paid an unofficial visit to Beijing, China, in this undated photo released by North Korea's Korean Central News Agency (KCNA) in Pyongyang March 28, 2018. KCNA/via Reuters ATTENTION EDITORS - THIS IMAGE WAS PROVIDED BY A THIRD PARTY. REUTERS IS UNABLE TO INDEPENDENTLY VERIFY THIS IMAGE. NO THIRD PARTY SALES. NOT FOR USE BY REUTERS THIRD PARTY DISTRIBUTORS. SOUTH KOREA OUT. NO COMMERCIAL OR EDITORIAL SALES IN SOUTH KOREA. North Korean leader Kim Jong Un and wife Ri Sol Ju, and Chinese President Xi Jinping and wife Peng Liyuan pose for a photo in Beijing, China, in this undated photo released by North Korea's Korean Central News Agency (KCNA) in Pyongyang March 28, 2018. KCNA/via Reuters ATTENTION EDITORS - THIS IMAGE WAS PROVIDED BY A THIRD PARTY. REUTERS IS UNABLE TO INDEPENDENTLY VERIFY THIS IMAGE. NO THIRD PARTY SALES. NOT FOR USE BY REUTERS THIRD PARTY DISTRIBUTORS. SOUTH KOREA OUT. NO COMMERCIAL OR EDITORIAL SALES IN SOUTH KOREA. North Korean leader Kim Jong Un and wife Ri Sol Ju, and Chinese President Xi Jinping and wife Peng Liyuan meet in Beijing, China, in this undated photo released by North Korea's Korean Central News Agency (KCNA) in Pyongyang March 28, 2018. KCNA/via Reuters ATTENTION EDITORS - THIS IMAGE WAS PROVIDED BY A THIRD PARTY. REUTERS IS UNABLE TO INDEPENDENTLY VERIFY THIS IMAGE. NO THIRD PARTY SALES. NOT FOR USE BY REUTERS THIRD PARTY DISTRIBUTORS. SOUTH KOREA OUT. NO COMMERCIAL OR EDITORIAL SALES IN SOUTH KOREA. North Korean leader Kim Jong Un and wife Ri Sol Ju, and Chinese President Xi Jinping and wife Peng Liyuan toast each other, in this undated photo released by North Korea's Korean Central News Agency (KCNA) in Pyongyang March 28, 2018. KCNA/via Reuters ATTENTION EDITORS - THIS IMAGE WAS PROVIDED BY A THIRD PARTY. REUTERS IS UNABLE TO INDEPENDENTLY VERIFY THIS IMAGE. NO THIRD PARTY SALES. NOT FOR USE BY REUTERS THIRD PARTY DISTRIBUTORS. SOUTH KOREA OUT. NO COMMERCIAL OR EDITORIAL SALES IN SOUTH KOREA. North Korean leader Kim Jong Un and wife Ri Sol Ju, and Chinese President Xi Jinping and wife Peng Liyuan meet, in this undated photo released by North Korea's Korean Central News Agency (KCNA) in Pyongyang March 28, 2018. KCNA/via Reuters ATTENTION EDITORS - THIS IMAGE WAS PROVIDED BY A THIRD PARTY. REUTERS IS UNABLE TO INDEPENDENTLY VERIFY THIS IMAGE. NO THIRD PARTY SALES. NOT FOR USE BY REUTERS THIRD PARTY DISTRIBUTORS. SOUTH KOREA OUT. NO COMMERCIAL OR EDITORIAL SALES IN SOUTH KOREA. North Korean leader Kim Jong Un and wife Ri Sol Ju, and Chinese President Xi Jinping and wife Peng Liyuan attend a banquet in Beijing, China, in this undated photo released by North Korea's Korean Central News Agency (KCNA) in Pyongyang March 28, 2018. KCNA/via Reuters ATTENTION EDITORS - THIS IMAGE WAS PROVIDED BY A THIRD PARTY. REUTERS IS UNABLE TO INDEPENDENTLY VERIFY THIS IMAGE. NO THIRD PARTY SALES. NOT FOR USE BY REUTERS THIRD PARTY DISTRIBUTORS. SOUTH KOREA OUT. NO COMMERCIAL OR EDITORIAL SALES IN SOUTH KOREA. North Korean leader Kim Jong Un attends a meeting with Chinese President Xi Jinping in Beijing, as he paid an unofficial visit to China, in this undated photo released by North Korea's Korean Central News Agency (KCNA) in Pyongyang March 28, 2018. KCNA/via Reuters ATTENTION EDITORS - THIS IMAGE WAS PROVIDED BY A THIRD PARTY. REUTERS IS UNABLE TO INDEPENDENTLY VERIFY THIS IMAGE. NO THIRD PARTY SALES. NOT FOR USE BY REUTERS THIRD PARTY DISTRIBUTORS. SOUTH KOREA OUT. NO COMMERCIAL OR EDITORIAL SALES IN SOUTH KOREA. North Korean leader Kim Jong Un smiles during a meeting with Chinese President Xi Jinping (unseen), as he paid an unofficial visit to China, in this undated photo released by North Korea's Korean Central News Agency (KCNA) in Pyongyang March 28, 2018. KCNA/via Reuters ATTENTION EDITORS - THIS IMAGE WAS PROVIDED BY A THIRD PARTY. REUTERS IS UNABLE TO INDEPENDENTLY VERIFY THIS IMAGE. NO THIRD PARTY SALES. NOT FOR USE BY REUTERS THIRD PARTY DISTRIBUTORS. SOUTH KOREA OUT. NO COMMERCIAL OR EDITORIAL SALES IN SOUTH KOREA. But experts say the definition of denuclearization has different meaning to the United States and North Korea, which emphasizes the need for the US to end both its military alliance with South Korea and its nuclear umbrella of the South and Japan. "The danger is entering into negotiations with unrealistic expectations that Kim is just going to hand over the keys to his nuclear kingdom. He won’t,” Vipin Narang, an expert on nuclear nonproliferation at MIT, told The Washington Post earlier this month. "The surest way for the summit to end in disaster is if President Trump enters with the false belief that denuclearization of the Korean Peninsula means Kim Jong Un unilaterally surrendering his nuclear weapons," Narang said. Sources told Kyodo that Japanese president Shinzo Abe and President Trump will likely address the time frame for the "complete, verifiable and irreversible denuclearization" of the North while Abe is visiting the US this week. Japan has reportedly proposed setting the target date for the summer of 2020, ahead of the Tokyo Olympics and Paralympics.